San Juan de la Cruz. Cordoba. 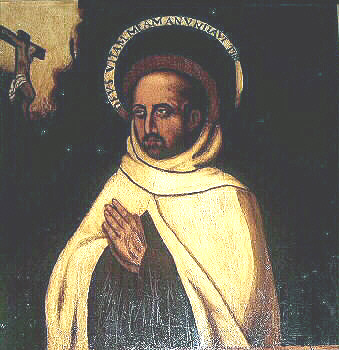 Spanish Mystic, whose real name was Juan de Yepes and Álvarez, although he/she is universally known by his religious name of San Juan de la Cruz. He/She was born at Fontiveros (Ávila) in 1542 and died in Úbeda (Jaén) 1591. With his contribution, the Spanish Mystic poetry reached its highest. He studied with the Carmelites in Medina del Campo, and in 1563, entered in the order with the name of San Matías Juan. Between 1564 and 1568 he/she studied at Salamanca. Before finishing his studies, in 1567, he/she met Santa Teresa de Jesús, who won it for the cause of reform of Carmel. Since that time, took over the reform of the men of the order branch, while santa did in the female. He/She founded convents at Alcala, Duruelo, Pastrana, Segovia and Ávila (convent of the incarnation). As head of the reform, was the subject of persecutions by the branch that remained in the Carmen Calzado. Thus, it was captured by the own monks and imprisoned in Toledo in 1577. His prison served him to compose memory part of his spiritual Canticle. After nine months in prison, he/she managed to escape and continue their mission, founding monasteries at Baeza and Jaén. In 1582 he/she founded with the venerable Ana of Jesús - which was Secretary of Santa Teresa - the convent of Granada. It was his most fruitful time as a poet: he/she composed the ascent to Mount Carmel, dark night and the living flame of love, and concluded the spiritual Canticle. San Juan de la Cruz, "on a night escura". Until 1585 it was prior in Granada and, from this date, Attorney general of Andalusia. He/She continued with his Foundation's work until his death at Úbeda in 1591. He/She is buried in the Cathedral of the city of Jaen. In 1726 was canonized and in 1926 proclaimed Doctor of the Church. Her feast is celebrated on 14 December, date of his death. The work of San Juan has come to us piecemeal: the problems he/she had with the Inquisition (which had destroyed part of his papers after his death) and his eventful life of founder has preserved us only a part, although enormously valuable in his work. "My beloved, the mountains, the valleys, solitary, nemorosos, the strange islands, sonorosos rivers, the whistle of the loving air." The aurora levantes par sosegadaen night.Quiet music, sonorous solitude, supper that recreates and falls in love with". This forces him to go to a linguistic experimentalism which is not, in the background, but eagerness to communicate something that surpasses the senses. Aware the poet of the difficulty of his work (which was described as "blunder" on occasion), resorted to prose explanations to clarify the terms of his compositions (thus, e.g., the glosses to the "ascent to the Mount Carmel", written between 1578 and 1583; the "spiritual Canticle" and the "flame of love", the two 1584; or the "dark night"(, 1579). However, the difficulty of the subject not cleared with these comments, at times, contributing to one darkness greater than symbols of poetry. As a poet, San Juan starts his work late, during the captivity mentioned in 1578, at the age of thirty-six, and continued until 1586. Since this date will be devoted to the correction of his writings. His poetic work, as it has come to us, is composed of two types of works: the mystical and those in which the poet explains parts of Scripture (thus Romances on the Gospel "In principio erat Verbum" ", about the Holy Trinity", or the "Super flumina Babilonis", translation in romance of the "Psalm pgsql"). Within the first paragraph - the most valuable, certainly of his work — can be distinguished, in turn, between simple parts (those that dealt to the divine profane choruses) and the great mystical poems. They are the first "living without living in me", poem that also Santa Teresa; glossary "After a loving lance's"; "For all the beauty"; and "without arrimo arrimo". With regard to the latter, they are the most difficult part of the work of San Juan and in them the symbolic language reaches difficult overcoming levels. San Juan de la Cruz. Spiritual Canticle. Noteworthy is their metric variety, ranging from the octosilabicas verses of "Hors where I didn't know", until eleven-syllable quartets from "a single pastorcico is repenting", through the use of the lyre in the "flame of love", the "spiritual Canticle" or in the "dark night", couplets with chorus of "Soul singing". "Nobody it looking, Amminadab nor parescia, and the sosegabay surrounding the caballeriaa view of the waters went down"
However the lack of logic, the poet creates a series of constant connections that the reader perceives through references and evocations that allow to follow the thread of thought of the poet and Platonic mystical sense of Renaissance intersects the biblical theme that. "On a dark night, forward on swollen love, oh dichosa ventura!, went unnoticed, once peaceful home". ALONSO, Dámaso; The poetry of San Juan de la Cruz (from this side); Madrid, Gredos, 1966. BOUSOÑO, Carlos; Theory of poetic expression; Madrid, 1970. YNDURÁIN, Sunday; Ed., poems; Madrid, Cátedra, 1993, 8th ed.